The dyed Merino range is the undisputed Wingham best-seller, with 125 shades to choose from. This product qualifies for the Wingham Fibre Discount. Without a doubt our Dyed Merino range is one of the best sellers at Wingham Wool, and has been for the past 10 years. Today we offer 125 different shades to choose from, all dyed to the exact same standards so you can sure of a consistency throughout the shades. We use 70s Merino in all off our standard range. We've found that this 21 micron fibre to be the perfect balance between being soft against the skin whilst still being strong enough to handle just about any spinning or felting projects. Some other sellers may use a lower grade of Merino for their ranges, which is perfectly fine, but worth bearing in mind if comparing prices. 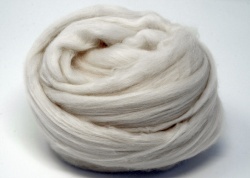 Our Merino is sourced from South America from non-mulesed flocks and dyed to Okei-Tex standards.